Wood fences are naturally beautiful, but they need extra protection to maintain this beauty over the years. 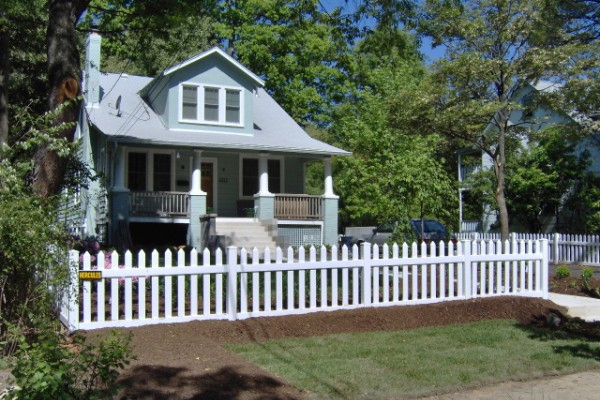 Whether it’s cleaning, staining, or general maintenance, it’s important to keep your fence in good shape so it can continue to look as good as it did they day it was installed. In this week’s blog, we’ll talk about good fence maintenance practices for protecting your wood fence. Why does wood need to be protected? Wood is more vulnerable to the elements than materials such as vinyl or aluminum. Water penetration can cause moisture damage, leading to rot and decay. Dry rot is also a potential issue with wood, which leads to cracking and warping. In addition, fungus and insects such as termites can eat away at the wood and break it down over time. Fortunately, sealing the wood protects it from these threats. In addition, some species of wood are more resistant to the elements. Cedar, for example, has natural oils that resist moisture and make the wood unappealing to insects. Pressure-treated wood is also more resistant to the elements. Sealing is the primary means to protect a wood. Sealant protects wood from moisture, insects, and rot. Learn how to seal a wood fence in our blog. Don’t forget that every part of the wood needs to be sealed. Even a small part of unsealed wood can suffer from moisture damage and decay. Also, look for a sealer that contains UV inhibitors, which will help prevent the color of the wood from fading. Removing mildew and other debris that build up on a wood fence is another important part of fence protection. Mildew and other organic matter can break down the wood over time. Use a mildew cleaning solution that is designed for use on wood. Apply it on the fence and scrub with a scrub brush to remove all mildew. After a thorough scrubbing, wash off the cleaning solution with the garden hose. What else can you do to protect your wood fence? First, make sure the soil doesn’t come into direct contact with the fence posts, as the moisture in the soil will leach into the wood. Concrete pads surround the post in order to prevent this, but often these pads are covered by soil due to the influence of rain and soil movements over time. Check the posts every so often and move soil as necessary. This entry was posted on Thursday, April 30th, 2015 at 7:56 pm. Both comments and pings are currently closed.